Janice Hardy: Happy Release Day! I've Got a New Novel Out! Happy Release Day! I've Got a New Novel Out! 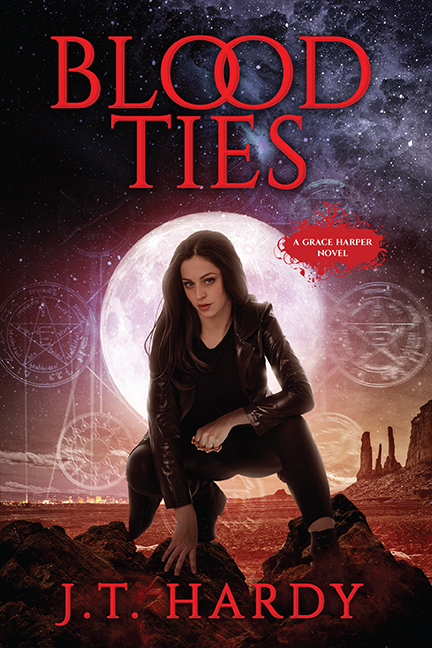 I’m excited to announce the release of my new novel, Blood Ties—an urban fantasy series for adults, and the first book of my new Grace Harper series. This novel has a special place in my heart (more on that below), and I’m so happy that it’s finally out in the world. It's been a long journey to get here, and one I never expected to make. Let me tell ya what it's all about! Grace Harper has spent her life on the run, ever since her mother’s unnatural death at the hands of creatures that shouldn’t be real. It’s hard to believe in vampires, but the things chasing her fit every legend she’s ever heard. She dubs them “Pretty Boys,” though their beautiful faces hide ugly appetites. For twenty years, she and her father have stayed ahead of them, but for the last five years, their lives have been quiet. Grace has found a home, a life, and people she could even care about. She thinks the nightmare is finally over, but then a man shows up asking questions about a missing woman who’s somehow connected to her and her mother. He might also have answers about her mother’s death, if she’s willing to take a risk. Before she can decide, she’s attacked by a Pretty Boy and barely escapes. If the Pretty Boys have found her, it’s time to run. Reluctantly, she prepares to abandon her life, possible answers, and the only friend she’s ever had. Until they take her father. Fleeing is no longer an option. To find him, she must face ancient secrets, creatures from legend, and an unbelievable truth that will shatter her world. But to save him, Grace has to do the hardest thing of all: stop running and start fighting. Blood Ties is available on Amazon in both paperback and ebook formats.